Four of the Pack’s car in the starting gate getting ready to race down the track. Photo: Beth Tolin. 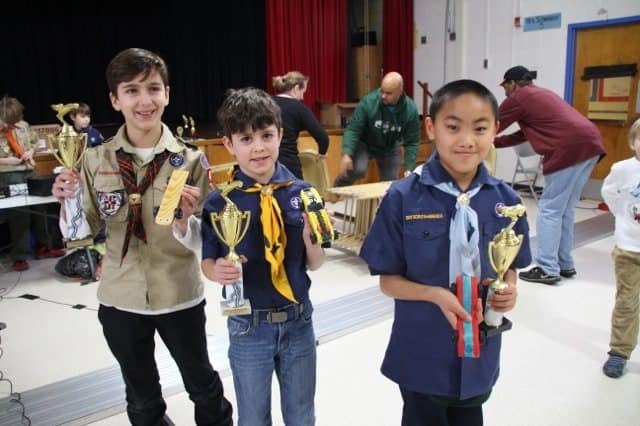 Scouts with the fastest creations at the Pinewood Derby Track: (l-r) Nicholas Bazarko (1st), Graham Harrison (2nd), Nicholas Niforatos (3rd). Photo: Beth Tolin. Pictured are the scouts who won awards for most imaginative cars: (l-r) Nate Bauser (tied for 3rd, Minecraft inspired car), Matthew Tolin (tied for 3rd, Radio Flyer Wagon with his dog riding), Ben Klein (1st, Bowling Lane car), Brandon Williams (2nd, Fish car with sparkled tail fin). Photo: Beth Tolin. Princeton Cub Scout Pack 43 took part in one the Cub Scout’s grand traditions, the Pinewood Derby, on Saturday, Jan. 24. Kids, with the help of parents, built their own car creations from a block of wood and then raced them on an official Cub Scout Pinewood Derby track against other pack members in a fun-filled competition that is a highlight of the year for the kids.